Skyward Sword is starting to have me extremely confident that it will be the Zelda game which comes with some answers and ties together a lot of the unknown aspects of the Zelda story and timeline. With the recent discovery that the trailer music shown at GDC played backwards is actually Zelda’s Lullaby from Ocarina of Time, we see a both direct and mysterious connection to Ocarina of Time. As the song of the Royal Family, this is either just Nintendo messing with our heads, or more likely, them providing a cryptic message that Skyward Sword truly will have a story that connects directly to Ocarina of Time. In the past, pre-Ocarina of Time has been the dumping ground for backstories to other titles in the series, especially Twilight Princess and Ocarina of Time. We have a lot of stories that take place in that era, but no real indication of how they all fit together. Along comes Skyward Sword placed chronologically in this very position, and to justify that, it must have answers. Creating a direct prequel to Ocarina of Time is a gutsy move by Nintendo, and they are going to have to deliver on this with a killer connecting storyline. Although, we do know this is The Legend of Zelda series, so when I say this is a list of things Skyward Sword “must address”, I mean things that it could, and really, things that it should. E3 2010 immediately got the theorist side of me excited, making connections to what Skyward Sword could potentially cover. With almost a year for it to have sunk in, this is my list of the storyline elements that I would love to see Skyward Sword tackle and further explain. At the very least, finally, Skyward Sword should put an end to the small faction who passionately cling to The Minish Cap coming first in the chronology. It’s time to let go of that myth! Without any further waiting, these are what I think Skyward Sword must address if it wants itself to be considered a true prequel to the classic Ocarina of Time. 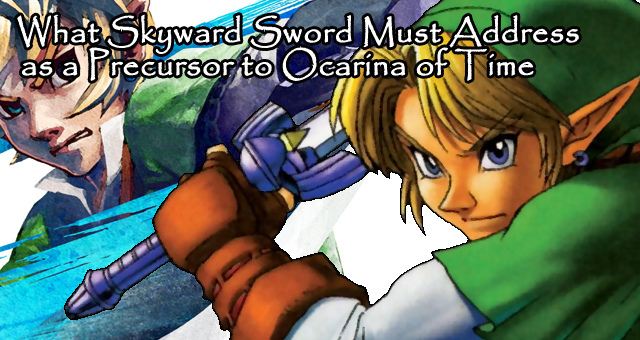 The origins of the Master Sword: Not a special point, but more for clarity’s sake. This is already confirmed to be somewhat involved through the Skyward Sword becoming the Master Sword. The building of the temple of time and sealing of the Sacred Realm: “The ancient Sages built the temple of Time to Protect the Triforce from evil ones”. Given that Skyward Sword is the Master Sword’s origin story; how exactly the whole Temple of Time came about to guard the Sacred Realm must be addressed. Origins of the Ocarina of Time and Spiritual Stones: How did these artifacts come into the picture to protect the Triforce. The Oocca: “According to legend there was a race even closer to the gods, some say these creature made the Hylians.” How were the Oocca involved in early Hylian days? What was their role in the creation of the Temple of Time? The Messenger to the Heavens: “There is a story from the time when the Oocca still maintained contact with the royal family.” This was done through the Dominion Rod and the Messenger to the Heavens. Could this be Link in Skyward Sword? The Sheikah: It is Impaz in Twilight Princess who claims the story of the messenger to the heavens as a Sheikah tale. We also know that the Sheikah were wiped out or vanished prior to Ocarina of Time as they guarded the Royal Family. How and why? What’s the go with their torture chambers in the Shadow Temple and Well? Who and what exactly are the Sheikah, and how did Impa survive? At long last the mysteries should be revealed. We’ve seen Sheik’s harp present in a Skyward Sword trailer, and many are suggesting that the mysterious new character is also a Sheikah. The Fiecre Wars/Prolonged Wars/Unified Wars: The Hero of Time’s mother was wounded in a great war where the King of Hyrule unified the lands. The Deku tree calls it a fierce war. Gor Coron in Twilight Princess calls it the “prolonged wars”, and hints at the Sheikah “dwindling” at that time. Unifying of Hyrule and the Rise of the Royal Family: The Royal Family didn’t come from nowhere. They unified the land of Hyrule under the King, and this is one of the main points that Skyward Sword should address. Hyrule’s Bloodstained History: “Here is gathered Hyrule’s bloody history of greed and hatred…” Skyward Sword, it’s time for us to learn about this history. The Interlopers and The Twilight Realm: The “interlopers who excelled at magic…tried to establish dominion over the Sacred Realm.” For that, they were banished to the Twilight Realm. Could this occur as a part of the story in Skyward Sword? What is the Fused Shadow? Any connection to the Sheikah? The Light Spirits: If we see the Interlopers, we must see the Light Spirits seal them away. Perhaps Skyward Sword will even explain why there are four Light Spirits, yet only three of them were involved with the interlopers and Hyrule proper. The Goron Hero and Volvagia: “A long time ago there was an evil dragon named Volvagia living in this mountain…Using a huge hammer the hero of the Goron’s…BOOM!” It’s time to address the Hero of the Gorons. Given that Darunia is a descendant of this hero and the King of the Gorons, this event could tie into the founding of the Goron hierarchy. The Sleeping Zelda: Logically, the sleeping Zelda should be the first one in the timeline. That way The Adventure of Link’s explanation of why all Princesses are called Zelda holds true right across the timeline. Could we see a Zelda in Skyward Sword who is the sleeping Zelda? The Ancient Hero: Lastly, tying it back to the first point, is the ancient hero mentioned in Twilight Princess the Hero of Time, or the Link we see in Skyward Sword? Have I missed anything? What other elements of past Zelda storylines do you want to see explained in Skyward Sword? Personally, I’m thinking at the very least we’re going to get the rise of the Royal Family, some history on Hyrule, The Master Sword, and the Sheikah – finally. Of course the Master Sword is already confirmed as a significant part of the plot. Consider the backwards music of the trailer, and the fact that the Royal Crest is in the game’s logo – we should be seeing at least some stuff about the Royal Family and The Maser Sword. We already know that the story for Skyward Sword was written before the game begun development, so there is potential for deeper connections than ever before. Nintendo is being quite secretive about Skyward Sword, so hopefully that means it has lots worth surprising us with. My excitement for this is becoming harder and harder to contain. E3 2011 is going to be amazing.